We have won Champion Meat & Poultry Award for the second year running! 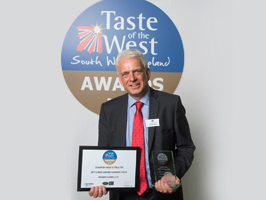 After the success of winning 12 golds for all 12 bacon and gammon products entered in the 2016 Taste of the West Product Awards, we went on to become finalists in the Bacon, Meat & Poultry and The Carol Trewin South West Producer of the Year Awards. We then went on to WIN Champion Meat & Poultry Award for our Dry Cured Smoked Gammon Steak. Of the product, the judges said “I could eat this every day and never tire of it. A lovely lean piece of gammon with a subtle sweet smoke which doesn’t detract from the wonderful ‘piggy’ flavour”. The Champions were announced on Tuesday 4th October at a prestigious ceremony held at Exeter Cathedral, attended by over 400 guests. The lunch menu was specially created using Taste of the West Award winning products from across the region, including Denhay’s Dry Cured Unsmoked Gammon Joint for the main course.